“Home ownership remains one of the most important aspiration for all Australians. It is critical that an incoming federal government recognises that many Australians move into home ownership through the private rental market,” said HIA Managing Director, Graham Wolfe at today’s launch of HIA’s Federal Election Policy Imperatives in Melbourne. 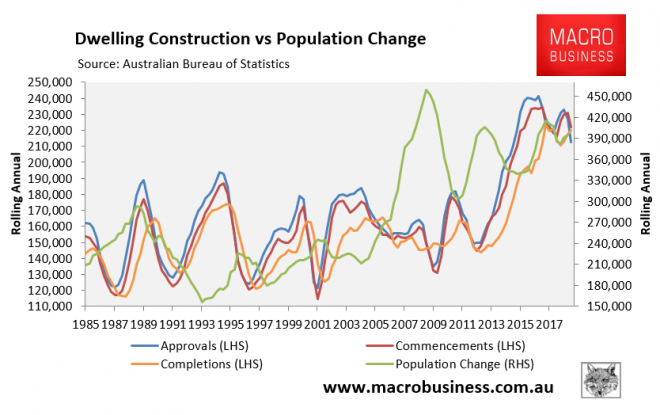 Righto, so Australia is failing to build enough homes and needs to boost supply, and yet juicing demand by running immigration at triple the historical average plays no part in this supply shortage? Pretty sure Ireland had a shortage as well. A dire shortage like none other in their history, iirc. It required a massive building effort to address all that shortage. An amazing shortage that just kind of appeared one day. Nobody really knew where it came from. Suddenly there just weren’t enough houses. One plucky Irish developer came to the rescue! Built and built and built. Couldn’t build fast enough. To be fair I don’t know what their immigration was like at the time though, that would certainly be a factor here since ours is pretty high by any standard. But most importantly, all the Irish demand was later revealed to be debt-foam demand. Demand created from enormous piles of nonproductive debt creating themselves from the very act of being created and attached to house prices, and the creation of debt giving the illusion of productivity. Demand that pretty much all disappeared as the debt stopped churning. That very helpful Irish developer came off pretty badly in the end, I also recall. The highest median multiple in the “Irish Housing Bubble” was 6.5 in Dublin. No other city went above 5. And Australians really think they are so different and lucky, that median multiple data sets for its cities, distributed around “10” aren’t insanely dangerous? – HIA overlooks the fact that there is no direct relationship between immigration and demand for houses. If all those immigrant would have say 300,000 dollars in their pockets then that would keep demand for houses high. But these immigrants are “underpaid” and can’t afford to buy a house worth say 200,000, 300,000 or 400,000 dollars (either with or without a mortgage loan). – Perhaps the HIA can persuade our banks to give (no, NOT lend) those immigrants the money to buy the houses ? Then I can guarantee that demand for houses will increase (more). 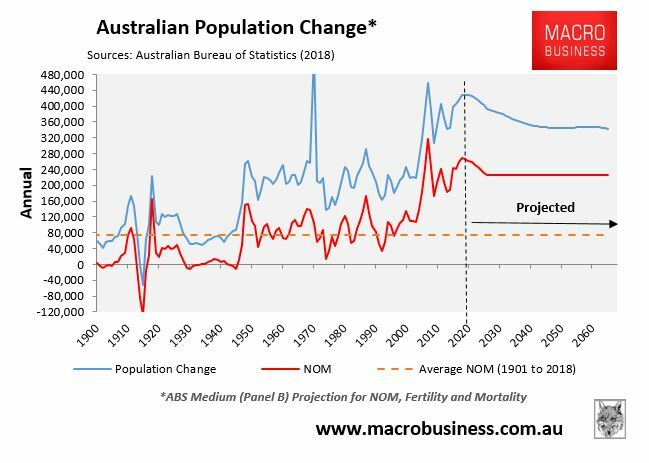 Yes – when median house prices nudge $1mil, demand isn’t in the form of people looking for a home, it’s capital looking for a home. At that point, whether or not there are also people looking for a home becames a side issue.